An atmosphere like no other, a paddock full of former drivers, and a track run that raised over $200,000 for charity. Jonathan Noble brings you tales from behind the scenes at the Brazilian Grand Prix. Interlagos might not have the facilities to match the modern super-venues like Yas Marina, or the glamour of races like Monaco, but the Brazilian Grand Prix has earned a special place as one of the classic events on the calendar. 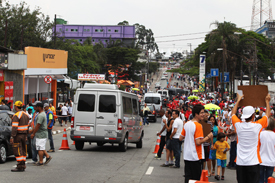 For all the difficulties the teams face, with a tiny paddock, small garages and the safety/security concerns of street life in parts of Sao Paulo, the Autodromo Jose Carlos Pace has an atmosphere that no amount of money could ever buy. The hairs on the back of your neck stand up as you enter the gates and pass the statue of the 1975 Brazilian GP winner; and to stand on the grid at Interlagos – with the crowds rising high up in the grandstands cheering for their heroes and jeering their enemies – is unrivalled. 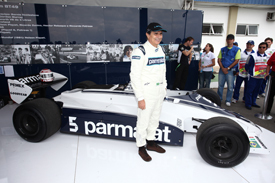 And the fans didn't know whether to clap or boo when Nelson Piquet demonstrated his 1981 title-winning Brabham BT49 on race morning, because although the laps were spectacular, he stirred up emotions by waving the flag of Rio de Janeiro's Vasco da Gama, who are rivals for the football league title with Sao Paulo's own Corinthians. The soul of the place probably explains why so many of North and South America's star drivers all made the trip to the Brazilian GP, including Jacques Villeneuve, Emerson Fittipaldi, Roberto Moreno, Tony Kanaan and Ricardo Zonta. And Carlos Reutemann, who has spent recent years focusing on politics rather than racing, made his first trip to an F1 race since the 1995 Argentinian Grand Prix. There were a few F1 debutants too, with music stars Jessie J and Macy Gray taking a look at proceedings ahead of their guest appearances at the F1 Rocks parties in Sao Paulo. The slow expansion of Formula 1's calendar up to nearly 20 events has of course meant the season now runs later and later – but that fact only really hit home in Brazil when paddock regulars were greeted by the sight of Christmas decorations everywhere. Having been in the heat of the desert a fortnight ago in Abu Dhabi, and enjoying similar fine weather on arrival in Brazil, it seemed slightly off-putting for the European contingent at least to be seeing Santa – and in need of sunglasses. Brazil marked a first for Ross Brawn too, as he had never spent a birthday at a race meeting before – because previous seasons had always finished by now. So next time the Mercedes team principal asks for the schedule to be shortened, you'll know why. The expansion of the calendar has also left teams and drivers with a bit of a headache in terms of arranging post-season promotional events and awards dinners. Red Bull left Brazil on Sunday night still trying to put together a plan to get its drivers from the FIA Prize Gala Awards ceremony in Delhi on the evening of December 9 to the streets of Milton Keynes for a celebratory demonstration run the following morning. "It will be the first time we've run both cars through the streets of Milton Keynes with both drivers," said team, principal Christian Horner, who thinks it'll be possible the get Sebastian Vettel and Mark Webber back in time, providing they don't spend too much time enjoying themselves in Delhi after picking up their trophies. There was a time when F1 drivers kept their helmet design for the whole season, but these days it seems hardly a race can go past without at least some of the grid changing their lid colours. We've got used to seeing Vettel retiring his design after it's been worn during a race-winning drive – so therefore quite regularly – but in Brazil there was a good contingent of drivers who joined the world champion in doing something special for the weekend. 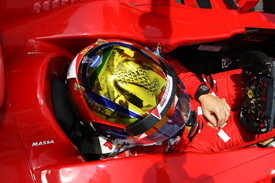 Notable among the drivers who changed helmets was Felipe Massa, who had a special design to celebrate his 100th race for Ferrari – which featured 100 Prancing Horses on its reflective colours. Kamui Kobayashi had a helmet that had been designed by Joe Hahn, one of the members of the band Linkin Park, whom the Japanese driver had met at the Singapore Grand Prix. Rubens Barrichello and Lewis Hamilton both ran tribute helmets in honour of Ayrton Senna, with Hamilton forking out of his own pocket for the special green lining that became the trademark of the late Brazilian. But in terms of doing something unique, Vitantonio Liuzzi came out on top with a special concept dubbed ‘K-Writeme'. The helmet was made with a special matt black finish, similar to that used on a blackboard. And it meant Liuzzi could scribble his own chalk designs onto the helmet at will – and even change colours between sessions. "It's fantastic," Liuzzi told AUTOSPORT. "Although I'm not sure what would have happened to it if it had rained…"
While we all get used to drivers complaining about traffic in F1, the busiest moment of the Brazilian GP weekend came on Saturday night when the grid was packed for the final Runthattrack group run of 2011. The charge down to the first corner drew rounds of applause from the few fans in the grandstands who'd stayed on into the evening – and it was a pretty impressive sight seeing a stream of people snaking through the Senna S on the way to finish the lap. And although the paddock's best runner, Sutton Photographic's Matthew Kingston-Lee, once again triumphed at the end of his championship-winning campaign, the real winner over the year has been children's charity Make-A-Wish Foundation. With F1 partner UBS donating money for laps that paddock members had completed on their travels from Australia to Brazil, the initiative was on the verge of raising nearly $200,000 by the end of the Interlagos event. Word of the good work had spread over the season and, after Nico Rosberg joined in the fun in Japan, it was Jenson Button's turn to do his bit in Brazil – and add $300 to the coffers. The McLaren driver completed a lap with his personal trainer Mikey Collier shortly before the group run, which he had to miss because of a clashing commitment elsewhere in town on Saturday evening. Writing about his effort on runthattrack.info, Button said: "Had to leave before the big race but still did a nice couple of laps with Mikey Muscles... Great job guys with raising so much cash for Make-A-Wish Foundation.. Cheers JB." Other drivers who completed the Brazil run were Rosberg, and Virgin Racing's reserve driver Robert Wickens. But a special word has to go out to Virgin's Barny Whitwham, who collected a Runthattrack award for raising the most money over the course of the year – an impressive $1900 – as the only man to have logged a time at every race track. Well done all. See you with your running shoes in 2012.